Oh, how I love playing around with photo editing software. It is so easy to make multiples of myself. More to love, if you will. If you want to try it, check it out here. I look good in color, yes? Dear Duncan ... I was just catching up on your blog and my oh my you've been a busy little westie boy. I think you and Julep are related because she is as stubborn as you [strike that] ... as westies can be. I would love to copy your post 'under the table' to my blog with a link back to yours - if you're okay with that. I couldn't describe the conversation with any westie as perfectly as yours. You can certainly copy my post ... Westietude can sometimes be hard to describe! Very cool! If one is good than more is better! Congrats on your graduation --- I bet you were at the TOP of the class!!!! How cool that is! You're famous, Duncan! 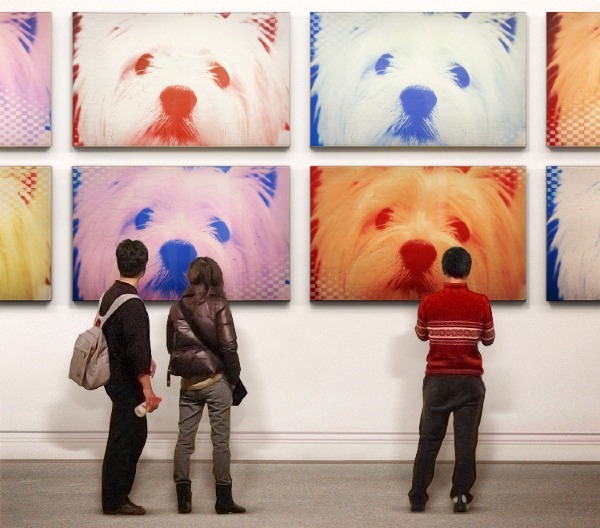 Well that looks like a great Andy Warhol piece of work! But, it is a Duncan Breazeale even worth more. That is a cool pic Duncan! Great site ~ Ma is goin' to play around with it this week, thanks!